When you are left alone with an elderly, it may be quite difficult to strike a conversation with him. This is most especially true if you are several years younger and you are not close to the senior citizen. However, just staying quiet may cause him to feel that he is alone. A conversation is a great way to keep him from getting bored. 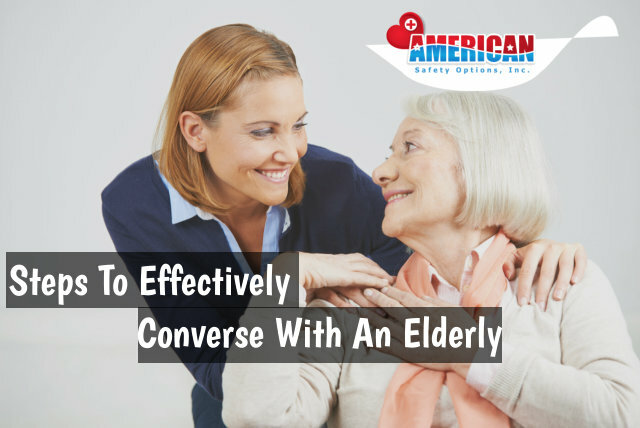 How do you converse with a senior citizen in an effective manner? Check out the following tips from us here in American Safety Options, Inc. If he will not take after a few minutes has passed, you might want to introduce yourself to the elderly first. He might not remember you due to a certain condition he may be suffering from, like dementia. In most cases, he will initially regard you as a stranger. When you introduce yourself, see to it that you will speak to him clearly and loudly but do not yell. Doing so will help the elderly understand you, especially if he has a hearing problem. Most elderly people talk about their families all the time. They remember those days when their kids or grandkids are still young. They may even boast about the achievements of their family members. Asking questions about his family can be a great conversation starter. He may go on and on about his family. To show your respect, listen to him and pay attention. However, you should not assume that all senior citizens would want to talk about such topic. If you only get a short answer, it may be time for you to change the subject. The elderly might bring up a good story in relation to the place where he was born or where he lives. If you know the place, you can politely tell him your opinion. For instance, if he lives near a tourist spot that you have went to previously, you can give him an adjective or two about such place. If the elderly is not the very talkative type, then, you may need to lead the conversation. You can talk about things that both you and the elderly have in common. However, make sure that you know when to stop or else the elderly might get annoyed. People love compliments. In that case, you can use compliments to strike a conversation. For instance, you can compliment him on his outfit, hair, and others. An elderly will enjoy polite yet fun conversations with a companion. If you are looking for companion care from a Home Health Agency in Newtown Square Pennsylvania, call us now!